Rocky Mountain Clean Air Action and the Colorado Citizens Against ToxicWaste today filed a notice of intent to file suit against the U.S. Environmental Protection Agency because of its failure to strengthen clean air standards for radon at uranium mill tailings. Radon, a radioactive gas, is a serious health threat. According to the U.S. Environmental Protection Agency, there is no safe level of radon exposure. Lung cancer is a risk, regardless of how much radon a person might breath in. Under the Clean Air Act, the Environmental Protection Agency was required to review and strengthen standards for radon pollution from uranium mill tailings by 2000. The agency has yet to do so, putting communities across the Rocky Mountain region at risk. Sadly, the Town Council of Erie, Colorado approved a request by EnCana to drill six new gas wells, some near residential areas of the town. While the drill rigs will be temporary, from a clean air standpoint, the real concerns are the producing gas wells. When the wells are drilled, the natural gas will flow, along with toxic gases like benzene, toluene, ethylbenzene, and xylene. It's pretty much inevitable that some of these gases are going to be released into the air from well equipment. The possibility that children might live near these future gas wells is frightening. The Town Council of Erie may have missed an important opportunity to protect its citizens. Hopefully in the future, local governments will more closely scrutinize oil and gas drilling plans to make sure companies like EnCana fully protect the health of children and families from toxic air pollution. 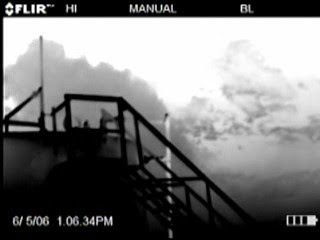 Toxic air pollution, viewed with an infrared camera, spews from a natural gas condensate tank. There are over 5,000 of these tanks north of Denver and more to come, possibly in Erie. David Harsanyi of the Denver Post and the Rocky Mountain News' Vince Carroll are the latest to join Rocky Mountain Clean Air Action in questioning our move toward more ethanol burning here in Colorado. While their rhetoric is geared toward bashing public health advocates, they raise some good points. Why are we pushing for more ethanol use when the science seems to indicate it won't protect clean air and won't protect our health? Actually get a bus system that runs on-time all the time. These are just a few ideas. Have anymore? It's not just Denver with unhealthy smog lately, monitors in the Colorado Springs area have also been registering unhealthy levels. In fact, recent smog readings show that Colorado Springs has had some of the worst smog pollution so far this year in Colorado. Whenever smog, also known as ozone, reaches 60 parts per billion or more over an 8-hour period, human health is at risk. So far this year, 8-hour smog readings have exceeded 60 parts per billion 5 days in the Colorado Springs area. The monitor in Manitou Springs has exceeded 60 parts per billion for the last three days and last Thursday, smog levels reached 79 parts per billion, the highest reading in Colorado so far in 2007. Last year, smog levels peaked at 79 parts per billion in Manitou Springs, and that was in July, typically the smoggiest month in Colorado. In 2004, smog peaked at 66 part per billion and in 2005 reached 75 parts per billion. In other words, smog levels are steadily climbing in Manitou Springs. With 8-hour smog levels in Colorado Springs already reaching 79 parts per billion, the outlook for the summer doesn't seem too healthy. With smog climbing in the Colorado Springs area, it may be worthwhile to expand Denver smog reduction efforts southward. It's being described as a smoking "ban," but really it's a boost for the health of the children, families, and workers at the Denver Children's Hospital. Although Rocky Mountain Clean Air Action doesn't weigh in on smoking issues that often, this is good news that we just have to trumpet. Clean air comes in many ways, including by promoting a healthy, smoke-free environment. Kudos to the Children's Hospital! Fighting Climate Change With Smog? heart disease by prior research, would in turn lead to a 4 percent increase in the number of ground level ozone-related deaths, or roughly 200 extra deaths a year. "Due to its ozone effects, future E85 may be a greater overall public health risk than gasoline," Jacobson writes in the study published in Environmental Science & Technology. "It can be concluded with confidence only that E85 is unlikely to improve air quality over future gasoline vehicles." The findings are even more disturbing given that here in Colorado, the number of ethanol fuel pumps has quadrupled this year and Governor Ritter is pushing for increased ethanol use. Unfortunately, the push seems only to promise smoggier and more sickly skies. True, using ethanol will help reduce greenhouse gas emissions and help combat climate change. But should we be fighting climate change with smog? The Colorado Oil and Gas Conservation Commission, which has been responsible for issuing record numbers of oil and gas drilling permits at the expense of clean air, is facing the reality of reform. In response rising concerns over the impacts of oil and gas development to our health, the Colorado Legislature is likely going to pass HB-1341, a bill that would require more health oversight of the Colorado Oil and Gas Conservation Commission. The bill calls for modest reforms, including less industry representation on the Commission and more opportunities for the Department of Public Health to comment on drilling permits. It's received support from the Denver Post and many others, and even industry opposition has simmered down. That hasn't stopped a few members of the Colorado Oil and Gas Conservation Commission to voice their opposition. One member, Brian Cree, actually resigned. Good riddance, it means there'll be room for more level-headed, open-minded people to be appointed to the Commission. So far this year in Colorado, 415 oil and gas drilling permits have been issued in Garfield County, 299 in Weld County, 180 permits in Yuma County, and 84 in Las Animas County. Yet by this same time last year, 246 drilling permits were issued in Garfield County, 207 in Weld County, 59 in Yuma County, and 71 in Las Animas County. Between this time in 2006 and 2007, the pace of drilling has so far increased by 68% in Garfield County, 44% in Weld County, 200% in Yuma County, and 18% in Las Animas County. While the Denver Department of Environmental Health is giving lip service to protecting citizens from air pollution, Rocky Mountain Clean Air Action is actually doing something about it. Today, we moved to make sure that vehicle tailpipe testing here in the Denver metro area fully protects our health. Air pollution from vehicle tailpipes contributes to smog, microscopic particulate pollution, and carbon monoxide, key threats to neighborhoods throughout Denver. The Colorado Air Pollution Control Division is proposing to overhaul its tailpipe testing program, yet there is little information showing that our health will be protected. The Division wants to scrap in-house tailpipe testing and instead rely on remote sensing. Remote sensing is where trucks stationed on highway on-ramps test your emissions. Many have probably driven past these stations already. The state's proposal is a good idea, but there's some serious kinks in the details. Right now, we have no safeguards in place to protect us from microscopic particulate pollution caused by tailpipes. The proposed overhaul does nothing to protect us from this dangerous air pollution. Adding to this, scientists and physicians now say that when smog concentrations reach 60 parts per billion or more over an 8-hour period, our health is at risk. Right now, federal health standards limit smog to only 80 parts per billion over an 8-hour period. The proposed overhaul does not ensure our health is protected based on the latest health science. Hopefully we can get a more convenient tailpipe testing program and fully protect our health. Rocky Mountain Clean Air Action Board Member and Director of the Environmental Integrity Project, Eric Schaeffer, was recently on NPR's Living on Earth. Eric used to work with the U.S. Environmental Protection Agency, where he led efforts to clean up dirty coal burning power plants. In response to Bush Administration efforts to rollback enforcement of clean air laws, he resigned from the EPA and founded the Environmental Integrity Project to fight these rollbacks. Read the Living on Earth transcript or listen online here. That's the headline of CEMEX's latest guest editorial in the Boulder Daily Camera. Maybe it's a typo, but we're not so sure. After all, both Rocky Mountain Clean Air Action and the Environmental Protection Agency have put CEMEX on notice of numerous violations of the Clean Air Act. We'll let our readers make the call. UPDATE: CEMEX's editorial headline has apparently been "corrected, but the link on the Boulder Daily Camera website still shows the original, http://www.dailycamera.com/news/2007/apr/14/cemex-taxes-public-health-very-seriously/. According to the U.S. Environmental Protection Agency, more ethanol use is going to lead to more smog forming pollution across the country. Adding to this, the EPA just announced that it's weakening clean air rules for ethanol production plants. These announcements come as Colorado Governor Bill Ritter is also pushing for increased ethanol production and use throughout the state. Ethanol may have a good side, but its ugly side is a pretty bad. Is the good worth the bad? Well, with alternatives like wind power, solar power, bicycles, human feet, and other nonpolluting forms of energy and transportation, we'd have to say no. An UPDATE: One thing we forgot to add was that many ethanol plants burn coal. And with clean air rules now weakened, many suspect that more coal burning ethanol plants are coming down the line. The oil and gas industry dominates the Division's clean air enforcement work. Of the 53 enforcement cases in Colorado, 22 (43%) are against oil and gas facilities, more than any other industry. Canyon Gas Resources had more facilities violate clean air laws than any other oil and gas company, with three of its natural gas compressor stations or processing plants in western Colorado violating clean air laws. The Suncor oil refinery in Denver paid a total of $335,000 in fines for violating clean air laws. Other oil and gas companies that violated clean air laws include EnCana, Noble Energy, Pioneer Natural Resources, Transcolorado Gas, ExxonMobile, and Colorado Interstate Gas Company. Transcolorado Gas violated formaldehyde emission limits at one of its facilities in Rio Blanco County, Colorado. Sand, gravel, and asphalt companies were also big time violators of clean air laws. All we have to say is, thank you. That's because the building site at 1515 Wynkoop in lower downtown Denver, which is being developed by Hines Development has stepped up to keep its particulate pollution in check. Not only do they have water trucks and hoses spraying down the dust, they've actually decided to cease digging today because of more high winds. This response is refreshing to say the least. The particulate pollution was bad enough, but the fact that we're neighbors really shows that the folks working at the job site care more than we thought. So, although we railed against the development in our previous post, we'd like to take that back. We only wish that other polluters would be as responsive to their neighbors' concerns and have as much integrity. Thanks again. Hines Development, which is beginning construction on 1515 Wynkoop in downtown Denver, really made a mess of things yesterday. Excavation activities kicked up huge clouds of particulate pollution for hours while trucks tracked out dust all over the streets. Anyone walking within a block of this building site likely ended up with gritty teeth and watery, dust-filled eyes. We did. Yesterday was an extremely windy day and it was unfortunate the excavating company didn't let that stop things. Rocky Mountain Clean Air Action's office is right next to this building site and we actually approached the man overseeing the operations, named Lance. We asked them to stop kicking up so much particulate pollution. His response? They've got to keep going, they can't slow down. He then told us we were trespassing, turned his back and walked away. Sadly, the future building at 1515 Wynkoop is going to be LEED certfiied as sustainable. This seems like a joke. If Hines Development can't even keep particulate pollution in check, or listen to the concerns of its neighbors for that matter, we don't hold too high of expectations that they'll be qualified or committed to maintaining a sustainable building. Colorado House Bill 1293, which would safeguard schools and kids from busy highway air pollution, is coming up for a vote before the House Appropriations Committee. The Mothers for Clean Air Colorado are leading the charge. The bill, which would require highways to be located away from schools, has already passed one committee in the Colorado House, but now faces scrutiny because of its perceived drain on state finances. Interestingly, 80% of the financial responsibility for implementing the bill will be covered by federal funds already allocated for highway projects. Really though, aren't our children worth some extra expense when it comes to their health? This is our future we're talking about, and the future is worth all the investment we can make. The House Appropriations Committee will tackle HB 1293 on Thursday April 12 at 7:30 A.M. at the Capitol (room LSB-A). Come if you can, we'll be there, our children need us. Tri-State Generation is delaying construction of one of two coal burning power plants in southwestern Kansas. Its reason? The "company plans to pursue other natural gas and renewable energy plants to serve customers' immediate needs," according to a Wichita Eagle article today. These bold plans are certainly welcome news for clean air and our health. In previous posts, we've labeled Tri-State a "coal monster" because of its seemingly insatiable taste for more coal and failure to invest in renewables like wind and solar. This may still be half true, but we have to admit Tri-State is headed in the right direction with its recent plans. Of course, Tri-State still has plans to build one coal burning power plant in southwestern Kansas, burn more coal at its Craig power plant in northwestern Colorado, and still has an energy portfolio dominated by coal (see Tri-State's portfolio below). Nevertheless, this half step forward is a big one. BAGGAGE ALERT: We've previously commented that Colorado Air Pollution Control Division director, Paul Tourangeau, has some baggage to deal with as a former lawyer for Duke Energy. Comments on Colorado Confidential have brought attention to this in the wake of the Supreme Court's rejection of Duke Energy's arguments that it didn't have to comply with the Clean Air Act. Xcel Energy's coal burning Pawnee Power Plant, located in Morgan County northeast of Denver, last year spewed over 26,000,000 pounds of sulfur dioxide pollution, more than the four other coal burning power plants in the Denver metro area combined. On a per-megawatt basis, the one coal-fired boiler at the Pawnee power plant also releases more nitrogen oxides. What's worse, all this pollution is illegal. In 2002, the U.S. Environmental Protection Agency cited Xcel Energy for illegally upgrading the Pawnee power plant without installing up-to-date pollution controls. For over four years now, this enforcement action has remained unresolved. All the while Xcel has been fouling the air. One thought on why this enforcement action has gone nowhere so far is because of some uncertainty about what constitutes an illegal upgrade. Fortunately, the U.S. Supreme Court instilled some certainty earlier this week. In the wake of the Supreme Court's ruling, hopefully the Environmental Protection Agency will follow through with its enforcement and secure the clean air we need. Our health depends on it. At the heels of Rocky Mountain Clean Air Action's efforts to clean up the CEMEX cement plant in Lyons, the U.S. Environmental Protection Agency is now following suit. Last week, the EPA put CEMEX on notice that their cement plant violated the Clean Air Act hundreds of times since 1997. Not only that, but the cement plant is currently operating without legally required air pollution controls. The EPA's notice, which is posted on our website, is a boost for efforts to clean up the cement plant, and bolsters citizens efforts to hold CEMEX accountable to clean air and public health. Rocky Mountain Clean Air Action works to safeguard clean air in Colorado and the surrounding region. That includes the Black Hills of western South Dakota. And just recently, Rocky Mountain Clean Air Action scored a major victory for clean air in the Black Hills. In 2006, we challenged the state of South Dakota's decision to give an air pollution permit to Pope and Talbot, Inc., a logging company based in Portland, Oregon that operates a lumber mill in Spearfish, South Dakota. The Black Hills of western South Dakota are the most heavily logged forests in the Rocky Mountain region, and Pope and Talbot operates the largest lumber mill in the region. The Black Hills are one of the most heavily logged forests and Pope and Talbot's lumber mill is a major air polluter. Has the potential to release 636,000 pounds of particulate matter a year. Of this, the mill releases 242,000 pounds of particulate matter less than 10 microns in size, or 1/7 the width of a human hair. Such particulate matter is small enough to get into human lungs and is closely linked to respiratory ailments and incidences of asthma. Has the potential to release 558,000 pounds of carbon monoxide, which at high levels can kill people. The mill also has the potential to emit 46,000 pounds per year of hazardous air pollutants, including methanol and formaldehyde. Methanol can cause neurological damage and formaldehyde is a known carcinogen. Grossly underestimated hazardous air pollutant emissions and failed to limit toxic emissions to protect public health. The EPA's ruling will not only help clean up Pope and Talbot's lumber mill, but will also strengthen air pollution permits throughout South Dakota. This is good news for all air breathers in the Black Hills. The Supreme Court today made two landmark rulings today that will leave our air cleaner and our climate safer. First, the Supreme Court unanimously ruled that Duke Energy, the largest utility in the country, could not escape clean air laws by only keeping hourly smokestack pollution in check. Duke Energy had argued that, even though annual emissions increased at some of its power plants, because hourly emissions did not increase, the company didn't have to install pollution controls. The Supreme Court commented that Duke Energy's arguments seemed "too far a stretch." And they were. Duke Energy was arguing that it could increase its hours of operation and spew more pollution into the air, but not have to control its emissions. Their arguments violated a fundamental part of the Clean Air Act: Anytime a company modifies its power plant or other source of air pollution--including by increasing the hours of operation--and increases its overall annual pollution, that company needs to install up-to-date pollution controls to protect public health. Second, the Supreme Court ruled in a 5-4 decision that the U.S. Environmental Protection Agency has the authority to regulate greenhouse gases under the Clean Air Act. The Clean Air Act gives EPA the authority to regulate air pollutants that endanger public health and welfare, like carbon dioxide and other greenhouse gases. The EPA had taken the position that it didn't even have to review the health and welfare effects of greenhouse gases. Even though EPA has the discretion to decide which air pollutants to regulate, it still has to have a good reason for not regulating. The Supreme Court held that the EPA "offered no reasoned explanation" for refusing to assess how greenhouse gases affect public health and welfare. The Grand Junction City Council again passed a resolution asking the state of Colorado to install a network of smog monitors in Grand Junction and other parts of western Colorado. Remember, this is the second time in four months that the City Council has made such a request. At a December 6, 2006 meeting, the Council passed a similar resolution, supporting stronger clean air rules and requesting the state install smog monitors in the city. Citizens are also part of the clamor. Last December, Rocky Mountain Clean Air Action and several others made the same request. Why all the concern? Because increasing traffic, coupled with booming oil and gas development in Mesa County, is a recipe for unhealthy smog pollution. Unfortunately, without any monitoring data to act on, health officials are helpless when it comes to protecting citizens. Unfortunately, the state has so far balked at the idea of smog monitors in Grand Junction. The reason? A perceived lack of money. But the perceived lack of money seems to be just that, a perception. Reality paints a different picture. Did you know that in Wyoming, the state has required the oil and gas industry to help pay for smog monitors? It makes perfect sense. Industry is, after all, responsible for unhealthy smog pollution in western Wyoming. The Colorado Air Pollution Control Division however, has so far shirked the idea of requiring the oil and gas industry to help pay for smog monitoring. Making matters worse is that the state of Colorado is shortchanging our clean air. The state currently charges air pollution fees that are less than half what is required by the Clean Air Act. Colorado is losing out on nearly $3 million annually because of this. The issue here really doesn't seem to be about money, but about whether the Air Pollution Control Division has the initiative to help the City of Grand Junction and its citizens get the smog monitors they need. For the health of the Grand Valley, hopefully the Division will pull through.